On Wednesday, March 27, trading in the euro ended lower. In the five trading days the euro fell against the US dollar by 1.48% - the news Brekzitu had a negative impact on the euro through the cross-pair euro / pound, the dollar becomes more expensive aversion from risky assets. I note that the US dollar has appreciated by falling yields on 10-year bonds, because the focus of market participants to keep the yield difference between 10- and 2-year bonds. I do not know who she's inverted, at the moment the value of US10Y yield (2.35%) more than US02Y (2,18%) and US03Y (2,19%). Fuel to the fire poured ECB President Mario Draghi. He said that the planned increase in the basic interest rate in the euro zone may be delayed if necessary. At 10:00 UK will publish the index of house prices from Nationwide in March. At 12:00 the Eurozone will report on changes of the monetary aggregate M3 and lending to the private sector in February. At 12:10 pm with the speech by the representative of the ECB De Saguin. At 13:00 in the euro zone will be released consumer confidence index, the index of sentiment in the economy, the index of business optimism in industry and the index of business sentiment for March. At 15:30 US declare the change of volume of GDP for IV quarter and the number of primary applications for unemployment benefits. At 16:00 Germany will present the consumer price index for March. At 17:00 the US announced a change in the volume of outstanding transactions on home sales in February. At 18:00 the Eurozone will publish an index of consumer confidence for March. At 20:15 to give a speech of FOMC members John Williams. High volatility in the market is maintained due to the uncertainty of Brekzitu and flight from risky assets. On Wednesday, the EURUSD closed lower, and is now one euro is 1.1256. EURUSD on the hourly chart shows that the strong support formed at 67 degrees. Price is 14 points away. The levels Gann conditions for the upward correction to perform. I do not like two things. The first - the price of EURUSD is growing without volume. The second - the Stochastic Oscillator moved into the sales area. Immediately there were thoughts that are likely under the 1.1240 hidden protective stops on long positions. If so, then in order to activate the limit orders of large players, it is necessary to disrupt them. When triggered stop orders (Sell Stop - it may be protective stops and new short positions) to increase the volume of euro for sale, which must buy back buyers EURUSD. A surge of volume recovery can already be seen to 1.1295 EURUSD price channel. 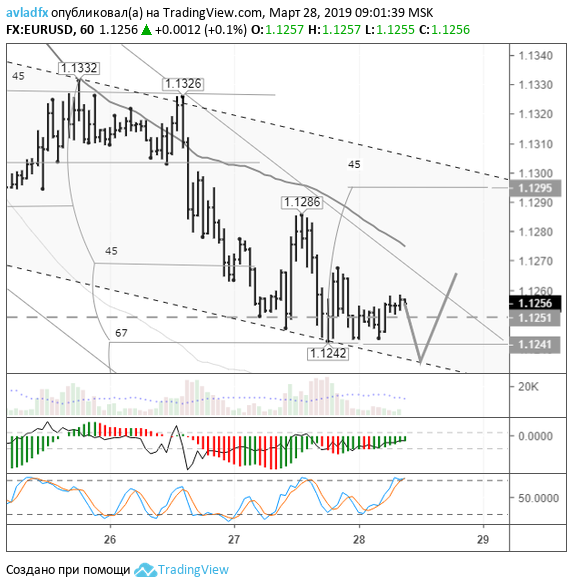 On the lower line of the channel to rebound we expect from 1.1236. If EURUSD sellers abandon this venture, then, after a brief pullback and reduce the area of ​​stochastic below 50 and we can expect a breakthrough trend line at 1.1265. Watch out also for the headlines in the news.